AllegroMedical.com provides you with premium options when you need an electric 3 wheel scooter. No matter what sort of three wheel scooter is required, you can find only the very best options here. Choose from the leading manufacturers of three wheeled scooter options, including those from Pride Mobility, Drive, Shoprider, and Zip’r, among ohers. Whether you want a folding electric 3 wheel scooter, a heavier duty three wheel scooter or even a hybrid three wheeled scooter, there are many models waiting for you to choose from. 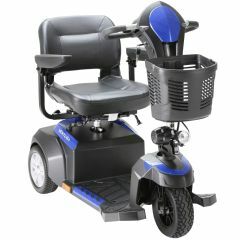 AllegroMedical.com offers only the best in three wheel motor scooters and accessories at the lowest prices guaranteed. See our Best Price Guarantee for more details.